Frailty in the elderly population is an important predictor of surgical outcomes. It has been quantified by several models, including the modified frailty index, which has demonstrated applicability in many surgical subspecialties. We aim to conduct the first decade-long retrospective analysis of frailty and complications between open and laparoscopic colectomy. 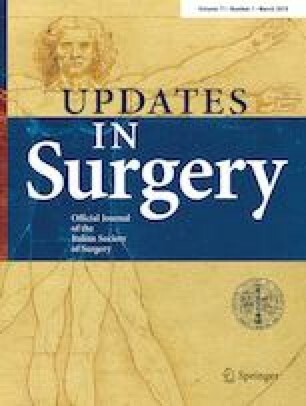 We used the American College of Surgeons National Surgical Quality Improvement Program database to identify colectomies performed between 2005 and 2014. Our primary outcome was 30-day mortality. Secondary outcomes were grouped into five categories: wound, hematologic, pulmonary, renal, or cardiac/vascular complications. Chi-square and multivariate logistic regression were used to identify significant predictors of outcomes. Of the 244,639 colectomies identified in our data set, 117,064 cases were included after exclusion criteria were applied. 42,192 (36%) cases were laparoscopic. Mortality rates among open colectomies in mFI cohorts 0, 1, 2, 3, and ≥ 4 were 1.2, 3.4, 7.9, 14.3, and 20.3%, respectively, while rates in laparoscopic colectomies 0.2, 0.7, 2, 3.5, and 5.4%, respectively (p < 0.05). Logistic regression showed increase likelihood of mortality with open colectomies in all mFI cohorts (p < 0.05). The open approach also had statistically significant higher rates of secondary outcomes in nearly all frailty levels. Our study analyzed the relationship of frailty, approach to colectomy, and postoperative complications. Laparoscopic colectomies resulted in lower mortality rates as well as less wound, hematologic, pulmonary, renal, and cardiovascular complications. All authors listed above contributed to the manuscript and have met all of the authorship guidelines as per the International Committee of Medical Journal Editors (ICMJE). Our research was approved and exempted by the Institutional Review Board at Rutgers-New Jersey Medical School.